While you ponder where the fifth stone tablet could be, Woody appears and asks you to follow him. Since the lighthouse's power has been restored by a lot, Woody is able to use his powers to generate a magical golden door at the base of the lighthouse. On the other side of the door is a golden platform in the sky. In the middle of the platform is a weird, old guy taking a nap. Woody introduces you to the Harvest God and asks him if he could give you any information about the island and its lighthouse. The Harvest God explains that the lighthouse dimmed because the tablets were lost, but the storm that caused the problem was indeed created by Gorgan the Underworld King. He isn't sure why Gorgan caused the storm, but none the less the god has something to help you: the fifth stone tablet! Down at the base of the lighthouse you're ready to set the last tablet, but a sudden severe storm is now blowing! You quickly set the fifth stone and things seem to be okay, when suddenly a bolt of lightning shoots down and destroys the tablet! The sprites wonder where that unexpected bolt came from. It must of been caused by Gorgan again. The Harvest Goddess and Edmond have a theory. Everyone heads back to the goddess' spring to decide what to do next. Walk back to the spring to meet up with the deities and Edmond. Harvest God is annoyed that Gorgan has destroyed his favorite pillow (as the old fellow had been sleeping on the fifth tablet). While everyone talks, Nova notices you and overhears the mention of Gorgan's name. She can't see the deities though, but after discussing the situation with her, she suggests that maybe Doc has an idea. After all, Doc was the one who fixed the third tablet. Back at Doc's house, the inventor tries to recruit Edmond to be his assistant before coming up with the idea to simply make a new fifth tablet! All he needs is 2 Jade, 10 Stone, and 1 Sunflower (version 1.0) or 1 Pink Rose (version 2.0 and Ps4/Switch). Jade Ore can be found in the mine and processed into Jade at Gus' smithy, and Carol sells Sunflower/Pink Rose seeds during summer. Bring the items back to Doc. The work might take some time to complete, so he requests that you take the Sunflower to Carol. Head to Beacon Town and talk to Carol inside her house. The flower gift implies that Doc has a little bit of a romantic crush on Carol (NOOOOOOO! ), so Carol requests that you return a White Rose to Doc. The inventor is excited to receive the flower, but understands that the White Rose means she's not interested (whew!). Doc then hands over the replica stone tablet. While it looks identical to the now-destroyed fifth tablet, Rowan can tell it doesn't have any magical properties. Back at the goddess' spring, the deities and Edmond try to infuse magic into Doc's creation, but they aren't strong enough; they really do need Gorgan's help. Harvest Goddess notices that the tablet is emitting a tiny bit of magic. A person tied to the Underworld must be nearby! Nova finally comes out of hiding and admits that she's Gorgan's daughter! Nova says that since she was little, she had dreamed of visiting the surface world. This idea was not acceptable to Gorgan, who would rather she marry and stay in the Underworld. In defiance of her father, Nova would sneak up to the surface. Eventually Gorgan learned about Nova's surface-world adventures. The king brewed up a great storm to scare Nova into staying underground, although he didn't mean to create the HUGE storm that blew away the stone tablets. If the island did eventually sink into the ocean, Nova would be stuck underground and Gorgan would be victorious regardless of the outcome. Nova was so angry at her dad that she took his stone tablet (the third one) and return to the surface to try and fix the lighthouse herself. 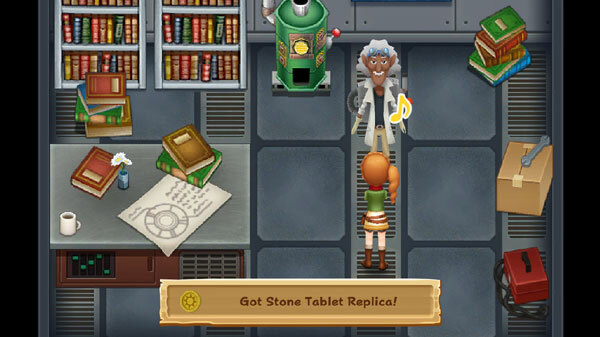 Since the replica tablet seems to react to Nova's earth powers, Edmond wonders if there is a way to amplify her powers. Nova says Gorgan has a Cyanocrystal that can increase the strength of her earth powers. Maybe they can just talk to Gorgan and convince him to help? The problem is that the road to the Underworld is beyond a bridge that is in need of repairs. While working on this task, the Harvest God, Harvest Goddess, Edmond, Nova, and the Harvest Sprites will stay at the spring for a while, allowing you to give gifts to all of them without having to track each one down. The broken bridge is next to Jeanne's house on the western side of the island. Repairing the bridge will cost 10 Material Stone, 30 Stone, 2 Mithril, and 5000 G.
10 Material Stone is obtained by taking 30 raw Stone to Gus' blacksmith shop. You'll also need to reserve another 30 raw Stone. This is easy to collect just by breaking up rocks with your hammer. Mithril Ore can be found deep into the mine, inside the orange nodes that appear starting on floor 31. To make it easier to go down through the mine, upgrade your hoe to the Expert Hoe (or greater) so you can till more than one square of mine soil at a time. This will help you find the hidden staircase down to the next level with less effort than using the one-square-at-a-time basic hoe. You'll need to collect 4 Bronze, 2 Silver, 10 Sunflower, and 3000 G, then take it all to Gus to have your hoe upgraded. Sunflower can be found wild during Summer or grow it from seeds at Carol's for 20 G each, which take 6 days to grow. You also have to upgrade your hammer to the Expert Hammer or higher, as the ore nodes on floor 31 or deeper can't be smashed with your basic hammer. The Expert Hammer requires 3000 G, 4 Bronze, 2 Silver, and 10 Cosmos flowers. You can find Cosmos wild during Fall season or buy Cosmos seeds at Carol's for 30 G each. Cosmos take 6 days to mature. You'll need to find 6 Mithril Ore to convert into 2 Mithril for the bridge repair to the Underworld Kingdom. After repairing the bridge, head into the Underworld to speak with Gorgan. Nova will meet you there for support as you demand the Cyanocrystal from the king. Gorgan laughs at your request, as he has no interest in preventing the island from sinking. He would rather the island disappears so his daughter is forced to return to the Underworld. Back at the spring, Edmond figured that Gorgan wouldn't be easy to convince. He suggests that perhaps putting the replica tablet in the panel and then somehow add to Nova's natural powers might work just as well as the original fifth tablet. Everyone heads to the lighthouse to give it a try (though Nova still can't see the deities), but it simply isn't enough power. The Harvest Goddess realizes that there's still an element of nature missing: Oliver the Harvest Sprite of Spirit still hasn't been located. To unlock the last fellow, Edmond suggests collecting flowers, wool, fish, "and the like," whatever that means. The Harvest Sprites will be more forthcoming with advice, and tell you to collect a Pink Dahlia, Great Wool, and Yellow Perch. The dahlia is a flower, and Carol sells the seeds at her shop. You can also find it as a wild flower during Summer season. Great Wool is collected sheep. The quality of the wool is random though; the more hearts a sheep has, the better the quality of wool. In this case, great quality is just one step up from normal Wool. Anything other than Great Wool will not count (e.g., you can't use Supreme Wool for this task). Yellow Perch is a fish you can catch on your farm in any season, either with or without bait. 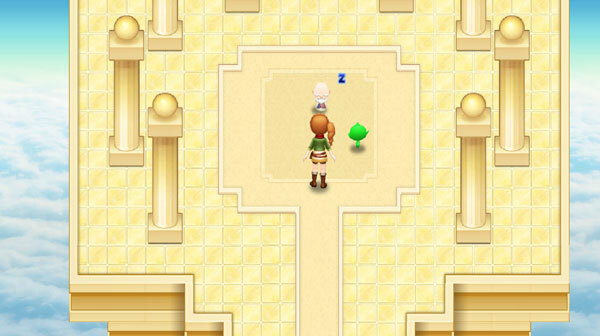 After you have the three items in your bag, return to the Goddess' Spring to awaken Oliver. Everyone is glad to see the last sprite! It's now time to combine all their powers to energize the replica panel. Head back to the lighthouse to set the panel again. Nova will be waiting for you at the lighthouse. Everyone puts forth their best efforts, but it still isn't enough power to energize the panel. As all seems lost, a great and mighty voice calls out from the base of the lighthouse. 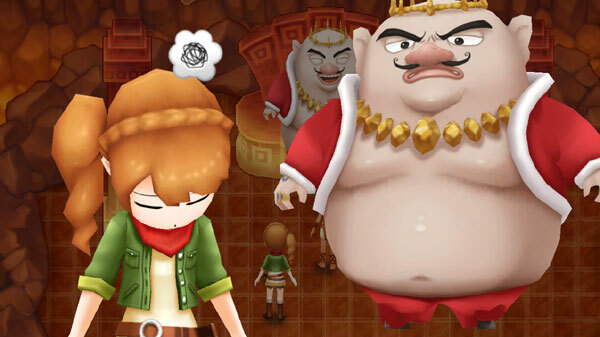 The magnificent Doc (and Jeanne) have arrived to give assistance, along with the rest of the Beacon Town villagers. If the deities' powers combined aren't enough, then they'll just include more people! Everyone uses their spirit to invigorate the panel, which does activate the great light at the top of the lighthouse. Nova is elated that everyone's effort were able to restore the lighthouse, even without Gorgan's help. Nova believes that it was her powers that was the catalyst for restoring the lighthouse (as she couldn't see the other magical deities) and is now confident that she is strong enough to survive on her own above ground. While Nova looks at the lighthouse, Flint appears and admits that he, well, kind of stole the Cyanocrystal from Gorgan and had it close by. Turns out while you and Nova had Gorgan distracted with your pleas for help, Flint took the opportunity to grab the crystal. The nearby Cyanocrystal did help to amplify Nova's natural powers, but Flint would rather that Nova be happy rather than knowing the Cyanocrystal was a factor. Underground, Gorgan can sense the lighthouse and laments that Nova seems to have her place on the surface world. Harvest Goddess and Edmond appear in front of Gorgan in their animal forms (bird and cat). Gorgan doesn't want his little girl to grow up, while goddess teases "daddy" Gorgan for not telling Nova how he truly feels. At this point the game's storyline has finished. You can now expand your house, animal barns, and build the bridges to the eastern side of your farm. New crop seeds will be for sale at Sam's shop: Blueberry, Watermelon, and Asparagus. Sofia will also have new animals for sale at her shop: Brown Chickens (6000 G), Brown Cow (20,000 G), Cotton Sheep (30,000 G), Silky Donkey (60,000G). These new animals only appear in her inventory if you have space in your barn to hold them; if your barn is full, they won't be there. She'll also now sell Miracle Potions (8000 G) you can use to breed your livestock. You can now also teleport from one area to another. 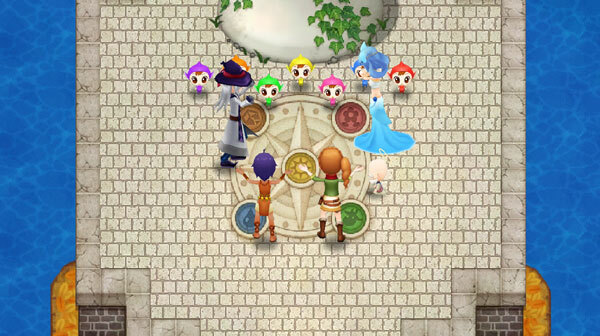 Open the Main Menu, select the Map, and then use your direction pad to move the highlighted area from one to another. Then simply press the action button to confirm you want to jump to that area. Less walking!